← Cargo Bike Ride on Easter Sunday – March 23rd. The four-year-old and I journeyed over the University Bridge to pick up some ski helmets we scored on Craigslist. We pulled into the Red Robin parking lot a few minutes early and waited for our helmet connection to show. 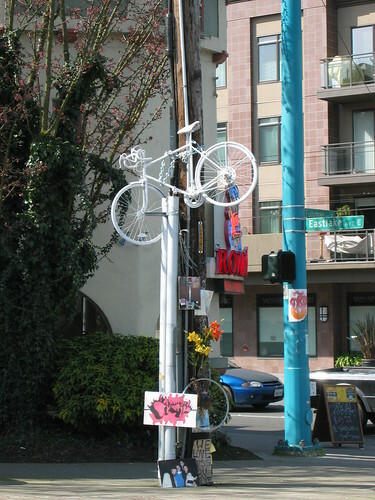 While we were waiting, the little guy noticed the Bryce Lewis ghost bike memorial on the corner of Fuhrman and Eastlake. By their nature, four-year-olds come with a lot of questions and this one has a finely honed curiosity. A white bike hanging from a utility pole isn’t something you see every day (thank goodness), but not something grownups tend to notice. Though evasion is a traditional parenting tactic, I couldn’t completely ignore the subject. I strive to be as open as I can with our kids. I didn’t want to scare him about dying on the bike (we still had to ride home!) so I went with a light explanation. I told him that a cyclist was hit by a car in that spot and that people place the white bike there to remind drivers to be more careful. He responded with an “oh” that made me wonder if he was really listening, and we continued our ride. More than an hour of biking and errands later, I got stuck waiting for traffic before I could enter the road. My young passenger was getting impatient. I told him that I’d go when it’s safe—that I need to wait for the cars to pass before I entered the road. His response? This entry was posted in bigger than here, bikes, consumerism, kids, traffic and tagged bikes, ghostbike, kids, parenting, safety, traffic. Bookmark the permalink. Ouch. Serious lesson, there, and never too soon to learn it. Losing innocence hurts, but not as much as losing some other things. Good job, Anne. The inquisitive nature of a 4 year-old is un-beatable! They notice everything but I don’t think it’s so bad for then to begin to understand mortality. Although I can imagine it would be confronting to have to explaining bicycle mortality to your child while your on your bike. My little one makes me stop any time we see a dead creature on the road! She is fascinated with it and seems to forming a realistic understanding. Unfortunately where we live roadkill is common so I often hear from the rear of my bike. Our 4 year old now asks if EVERY white bike he sees is a ghost bike. Thankfully, the answer is usually no.